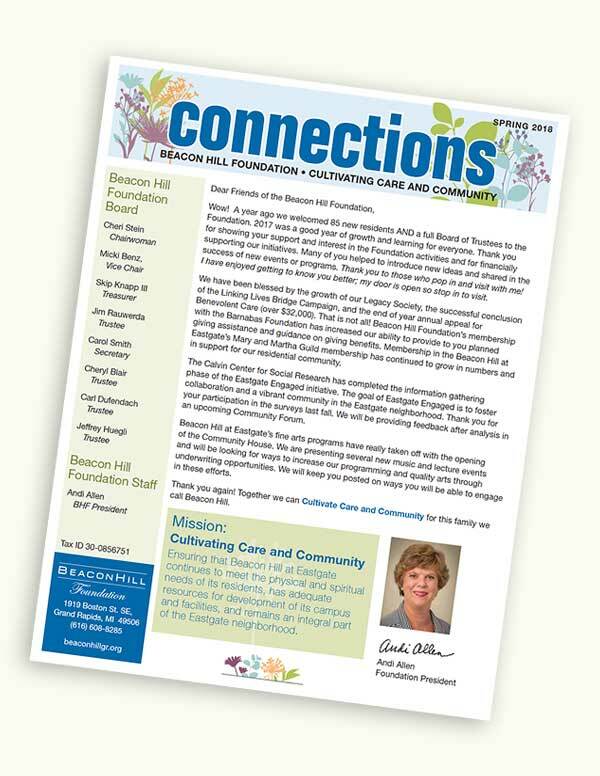 The Beacon Hill Foundation quarterly newsletter, Connections, keeps you up-to-date on how the Foundation is cultivating care and connections at Beacon Hill and the greater community. Learn about the exciting ways that we are meeting the needs of the residents both on and off campus and how you can be part of this effort. To take a look at our latest and past newsletters, click on the title you wish to view. You can then download these from the menu at the top of the screen. Thank you for your interest in the Beacon Hill Foundation. For further information on our foundation or to learn how you can help us grow, please contact Andrea Allen, at andi.allen@beaconhillgr.org.